United Launch Alliance Delta IV rocket blasts off from Space Launch Complex-37 with the U.S. Air Forces Global Positioning System (GPS) IIF-3 satellite on Oct. 4, 2012, at 8:10 a.m. EDT. 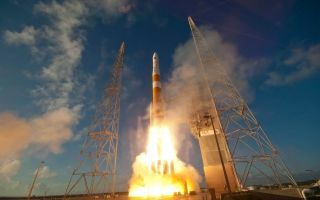 In this space wallpaper, United Launch Alliance Delta IV rocket blasts off from Space Launch Complex-37 with the U.S. Air Forces Global Positioning System (GPS) IIF-3 satellite on Oct. 4, 2012, at 8:10 a.m. EDT. This launch marks the 9th ULA launch this year, the 54th Evolved Expendable Launch Vehicle (EELV) mission, and the 65th launch since ULA was formed nearly six years ago.